It’s that time of year again, folks! That time of year when frugality goes away and we move forth to buy gifts for family, for friends, and maybe even a nice thing or two we've had an eye on for ourselves. In Michigan, there is a plethora of places to find exactly what you are looking for. From malls, to downtown shopping plazas and more, make sure to arm yourself with a credit card and coffee to keep yourself moving along. 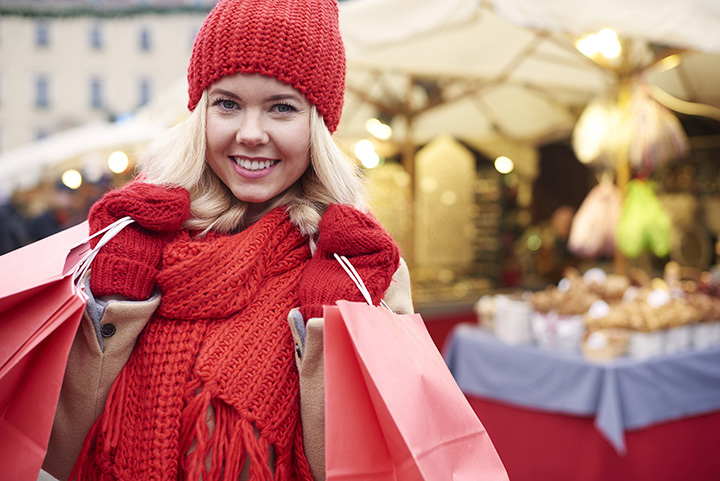 It’s time to check out these 15 great shopping destinations in Michigan. While there are still shopping malls in Kalamazoo—Crossroads is the one great survivor—the Kalamazoo Mall is a completely different matter. The first-ever outdoor pedestrian shopping mall in the United States, this converted section of Burdick Street is lined with shops. Designed by shopping mall pioneer Victor Gruen, shoppers here can get access to not only an array of shops, but also restaurant choices, and the great focus of arts and culture in town, the Epic Center. It likely won't surprise anyone that some of the best shopping in Michigan is found around Detroit, enjoying not only the higher-end Detroit suburb traffic but also the Canadian crowd. Among these magnificent shopping edifices is Somerset Collection in Troy, known for being upscale among upscales. Home to brands from Saks Fifth Avenue to Lego, Somerset Collection is even home to Somerset Films, a series of short films about the world of fashion. Michigan's got no shortage of outlet malls, and one of the best around is Birch Run Premium Outlets. It's not only the largest outlet mall in Michigan, it's also the largest outlet mall in the entire Midwest. That's right, Indiana, Illinois, and all the rest: you've just been Michigan'd. Special deals can be found on the mall's website, and the roster of stores on hand reads like easily one of the most upscale destinations around. Considering it's also got a consignment shop and an A&W outlet, well, there's a lot going on at Birch Run. Birch Run isn't the only outlet mall in Michigan. Not too far behind in Auburn Hills is a little something unique known as “the largest indoor outlet mall in Michigan,” Great Lakes Crossing Outlets. Considering this has an AMC movie theater, a Rainforest Café and other options, this might sound like just another mall. It's the unusual stores that really sell this, though, like the Neiman Marcus Last Call Clearance Center, the Victoria's Secret Outlet and Saks Fifth Avenue Off 5th that really drive the values home. Though it shares a name with the Marquette mall we'll talk about later, Westwood Mall in Jackson is an unusual proposition. Shopping is of course at a premium here with one of the last surviving Radio Shack outlets still on hand, and stores ranging from bath and beauty products to apparel for all ages are in play as well. Not so long ago, the building was also home to a massive chess set, with individual pieces about as tall as a nearby sitting bench. It is pretty much impossible to talk about shopping in Michigan without talking about Bronner's CHRISTmas Wonderland, a store wholly devoted to Christmas items. With ornaments, trees, and an undeniably Christmasy feeling almost constantly in the air, there are over 50,000 trims and gifts on hand. The store itself, at last report, measures the size of one and a half football fields, so if you can't find what you want at Bronner's, it may not actually exist. While the shopping is great at The Mall at Partridge Creek in Clinton Township, there's plenty of other reason to check out this shopping destination. An open-air mall that features a Nordstrom, a Parisian, and a complete movie theater, this destination also comes with fountains, a complete TV court, and in a saving grace for many, free Wi-Fi access. Those concerned about coming in winter, meanwhile, need not be: There's a 30-foot fireplace on hand as well as heated sidewalks that make shopping a delight in all but the worst weather. Featuring locations in Grand Rapids and in Howell— and in several other states as well—Tanger Outlets offer the kind of value that an outlet mall should. With multiple stores contained in each outlet, Tanger Outlets will deliver a shopping experience that's rich in diversity and overall value. With stores from Wilson's Leather to Perfumania, there are lots of bargains afoot on familiar and welcome brands. Head on up to Ishpeming for easily one of the most unique, or perhaps bizarre, shopping experiences you'll ever find. Da Yoopers Tourist Trap, official headquarters and gift shop extravaganza of the Michigan band known as Da Yoopers, offers all manner of Yoopers merchandise and Upper Peninsula handicrafts for sale. Shirts, sauna items, books and calendars, pet gifts, and an entire section devoted exclusively to flatulence—seriously, it's called the “Fart Section”—are all on hand. When you've finished shopping, check out unorthodox exhibits like Big Gus, the world's largest working chainsaw, and Eddy Da Woodburning Tractor, one of two wood gasifier-powered tractors in the United States. The Marquette version of the Westwood Mall, and home to the major stores like Payless, JCPenney and MC Sports, this shopping space offers plenty of options along with a series of special events. It's one of a handful of shopping malls found in the Upper Peninsula, so when a major retail brand is called for, this is one of the places to find it. If you're a bit confused, don't worry: The one in Jackson is largely a coincidence. Known mainly for its tulips and Dutch heritage, it may surprise some to note that downtown Holland is home to some impressive shopping. The Holland downtown district is home to a host of unusual shops offering just about everything from musical instruments to wine. Even the official Downtown Holland website was built in—you guessed it—Holland, so no matter what you're looking for, there's a good chance you'll find it in Holland. In a town known for just about everything, Grand Traverse Mall in Traverse City still manages to impress. With a slate of over 100 shopping options along with a carousel, and one of the last surviving mall-based arcades on the face of the Earth in the FunShop, there's even a “soft-play” area specifically geared toward the younger set. Throw in a dozen options for snacks and dinner and it's a complete experience in the middle of a host of others. Join me for a bit of a thought experiment, those of you not already familiar with the Meijer chain found throughout Michigan and parts of the Midwest. Picture a Super Walmart, with its vast array of goods and aisles of groceries. Now give it an impressive produce section, a bakery, a deli, a meat counter, and a garden center. That's Meijer. A Michigan institution for decades, it was founded here, and since then, it's only expanded outward, delivering its breed of value and high-quality goods everywhere its doors may open. The Masonic Square Mall in downtown Marquette is a unique animal. There aren't any major chain stores here—the closest thing is a Prudential insurance agent—but this mall, or rather the building in which it operates, has been on hand since 1890. The former home of the Marquette Opera House, and an office building with space leased by the Masons, a fire broke out in the building on the same day as the worst blizzard the town had seen in 65 years. Rebuilding followed, and the building became home to a variety of businesses, which brings us to today, where it's the equivalent of a shopping mall for small retailers. Winning awards from independent sources is a great way to measure the value of most anything, and when Bay City took the 1999 award for Great American Main Street from Main Street America and Preservation Nation, it was clear that this city had something exciting going for it. Featuring not only a slew of special activities ranging from the Soup & Sales event in early January and going on to free movies in the park in July and August, but also a wide array of downtown shops, this award winner hasn't lost its luster.